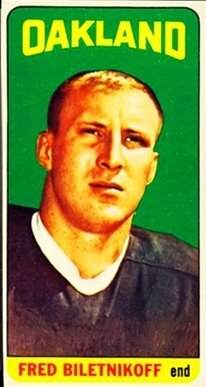 Fred Biletnikoff was an All-American at Florida State and drafted in the second round of the AFL draft by the Oakland Raiders and in the third round of the NFL draft by the Detroit Lions in 1965. Biletnikoff opted for the Raiders and played 14 seasons in the AFL and NFL with Oakland from 1965 to 1978. He recorded 589 catches for 8974 yards and is a member of the Professional Football Hall of Fame. Montreal lured Biletnikoff out of retirement in 1980. Biletnikoff was never known for his size or speed, but as a smart receiver with good hands and a knack for getting open. Those smarts and experience were why at age 37, Biletnikoff still turned in a very creditable performance with 38 catches, second best on the Alouettes and eighth in the East. After retiring from football as a player, Biletnikoff embarked on a coaching career, that started with High School teams, wound its way back to the CFL with Calgary in 1987 and 1988 and into the NFL. Biletnikoff finally retired from coaching with the Oakland Raiders in 2007.